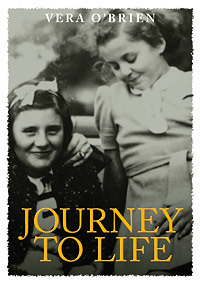 Vera Harth’s story poignantly describes how the Holocaust affected the life of one child, and determined her future. Her parents put her on the Kindertransport train to Britain on 1 July 1939. She never saw them again. She spent the War years in Sheffield with a foster family. Then her life took her round the world with her husband John O’Brien, who served first in the British, then the New Zealand Army. They were stationed twice in Malaya, but came to call the tiny New Zealand settlement of Waiouru home. There, Vera and John raised a family of six healthy, happy children. Vienna, Prague, Sheffield, Malaya, Waiouru–and back to Austria and Slovakia to find her family’s roots: Vera O’Brien was truly, as her daughter Veronica says, ‘the ultimate survivor’. Thanks so much for all your help in editing Mum’s book. 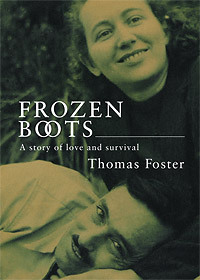 Frozen Boots ranges widely: from wartime Hungary to the bitter winters of the Soviet Union, from the ruined city of Budapest to the thriving housing developments of Sydney in the 1950s and 60s. In his tribute to the power of love, persistence and resilience, Tom Foster, born Fruchter, tells the success story of one Australian family. With grateful thanks for all your work. Dan Moalem, born in Shanghai in 1930, was raised in a conservative Sephardi family. Their lives centred on the Synagogue, of which his father was Shamash, and on his school. In his early years he was a protected child, with an Amah watching his every move. Much of his childhood was spent immersed in his vast extended family, and many hours each week were taken up visiting and socialising with them. Dan’s school life was active and productive. He was a versatile all-rounder, excelling in his studies as well as in many sports. His exposure to the Chinese people, their lifestyles, beliefs, traditions and practices, considerably broadened his horizons. 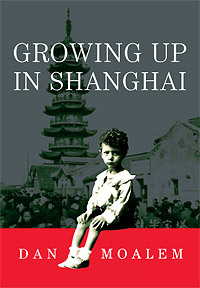 His vivid descriptions of life in Shanghai recapture a vanished time. His education was interrupted when the Japanese invaded China. The family, as British subjects, were interned at Lunghwa Camp from 1942-45. At War’s end, Dan embarked on an intensive study program in order to catch up with his education. At the end of 1947 he sat for the Senior Cambridge examinations and passed brilliantly. Then he studied Engineering at Aurora University in Shanghai– in French. During his time there, Communist forces captured Shanghai and he was part of the celebrations when the People’s Republic of China was proclaimed in October 1949. Dan completed his studies under the new regime. In late 1950, he migrated with his family to Sydney, Australia. Gratitude must go to my diligent editor Diana Giese, who spent endless hours recasting and amending much of the book. At the end of World War II, Halina Robinson was alone. She had survived the dangers and hostility of the Holocaust because of the courage of many Catholic Poles prepared to risk their own lives and the safety of their families to shelter and save her. At barely 17 after the War, she had to decide her future. Would she leave Poland, the country where generations of her family had made their homes and prospered, or would she stay and contribute to building a new, better society? She chose to stay. The chapters of A Cork on the Waves dealing with those heady, idealistic years also show her awakening as a woman, seeking a balance between study, career, motherhood and family life without the support of a family of her own. It also paints her growing disillusionment with the Polish People’s Republic. It was my first book. English isn’t my native language, and without encouragement, assistance, editing and advice concerning the flow of the narrative, lay-out, and even the colour of the cover, the book would not have its present shape. After printing, a concise press release, editing for an article, ideas for appearances…there seemed no limit to the help given. Halina Robinson is the matriarch of a large Australian family, and the centre of a wide circle of friends. 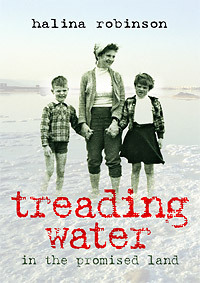 She has extended her story of survival in Poland during World War II, begun in her well-received A Cork on the Waves, to an account of her migration to Israel in 1957 with her Polish husband and two small children. Treading Water in the Promised Land tells of their attempt at establishing a new life in Beer Sheva on the edge of the Negev desert and later their move closer to Haifa, where Halina became a teacher in a school in Kyriat Nazareth. Migration is never easy. For Halina an added motivation was a wish to meet her favourite childhood cousin, one of only two relatives who survived by living abroad during the War, who later became a General in the Israeli Army. During her pre-War childhood Halina had dreamed of going to Israel, but as an adult, many things appeared different from her schoolgirl imaginings. Although she was the daughter of a committed Zionist, he was no longer by her side to guide her. In Upstream, the third volume of her autobiography, Halina Robinson continues the story of her remarkable life which began with her acclaimed memoir A Cork on the Waves and continued with Treading Water in the Promised Land. Upstream begins with her arrival from Israel in Australia in 1961. In her engaging style, Halina describes the joys and sorrows which have marked her transformation from a migrant to a committed Australian citizen. This is the inspiring story of a woman whose indomitable spirit, resilience and compassion have helped her not only to rebuild her own life, but also to make an impact on her adopted country through her important contribution to multiculturalism. 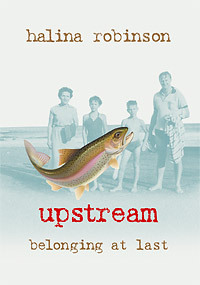 Upstream is the 40th title in the Sydney Jewish Museum’s Community Stories, an invaluable archive of the social history of the community for future generations. To my friend and mentor Diana, without whom not a single book of mine would ever have been published. George Sternfeld’s family came to this country in the 1960s, part of the great post-War migration of people from across Europe. Now he passionately calls Australia home. He, his parents and sister arrived with next to nothing, but all built successful lives. They migrated to live free from fear. Australia gave them the opportunity to be ‘normal’, to live lives that are happy and full, lives made up of the ordinary stuff of being human. 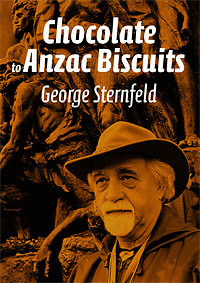 The value of Chocolate to Anzac Biscuits lies in the way it reveals the undying heritage of the past: two worlds and three cultures. The Sternfelds are survivors of the Shoah. 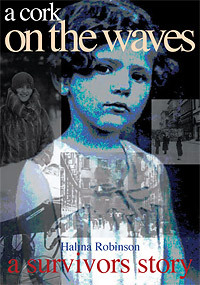 George was only a baby when his mother fled the Nazi occupation of Warsaw, but if she had not left, he would have died. The family left their home to spend World War II in icy Siberia. On their return, as Jews, they found themselves still blamed for the ills of Communist Poland. But this is not a gloomy book. With warmth laced with humour and irony and moments of profound sadness, George Sternfeld tells his story as a Jew, a survivor, a son, brother, husband and father willing to be a neighbour to Jew and non-Jew alike. Thanks most of all to Diana Giese for her skilful editing, for her wise guidance, suggesting structural changes, and for believing in the importance of telling my story. Diana’s gentle assertiveness made the book so much more interesting.